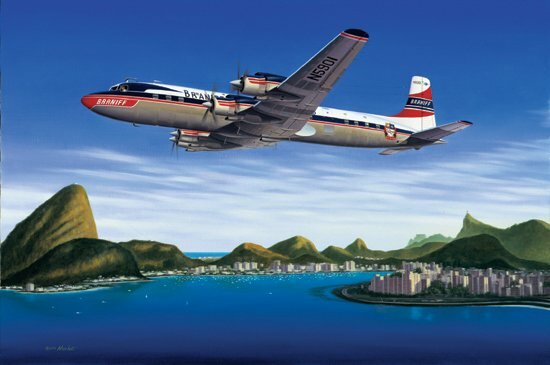 Image Size: 22.25" x 15"
Paper Size: 25.5" x 24.25"
One of the last of the majestic propliners, a Douglas DC-7C operated by Braniff International Airways climbs out of Rio de Janeiros' Galeao Airport. Named for its ability to span all oceans, the Douglas DC-7C "Seven Seas" was the final piston model of the famous "DC" series produced by the Douglas Aircraft Company. Designed to provide the ultimate in speed and luxury for commercial air travelers the model was short lived as the mainstay of international aircarriers. After only a few short years the DC-7Cs were pushed off to shorter routes by the new commercial jets.